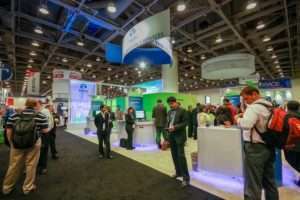 How Can a Great Trade Show Booth Design Reduce the Clutter Effect? In trade show marketing, a brand message needs to be clear so that when it is conveyed to the recipient there is maximum potential of engagement. Imagine there are 8-10 ads on a single sheet of a tabloid. Your mind would not be able to focus on the captions and message by a particular brand. Factors like better brand visibility, accelerated engagement, and a better likelihood of conversion would favor a clutter-free advertisement on the newspapers. This is exactly the value provided by clutter free marketing and communications messages delivered by an intelligent custom trade show booth displays. Now in a trade event too, there are quite a few factors that contribute to the clutter effect of a brand. With the limited real estate presented to a brand to display in the trade show booth, there is a very high chance of clutter effect being detrimental to your sales prospects. Additionally, the high volume of footfalls and movement in the event venue too contributes to the clutter effect. What can you do to ensure that curiosity is piqued, your brand’s appeal is elevated, and ultimately conversions are achieved? Of course, reduce the clutter around the booth design! What Issues Can Plague a Cluttered Booth at a Trade Show? Your role at a trade show is clear – to attract as many interested leads as possible. Simply having a bright signage and bold messages won’t be enough. It is needed to use the limited space by having a cohesive and neat booth design. If this doesn’t happen then the number of footfalls will be poor. Even if you have invited existing client accounts to explore your range of products, it would have a counter effect on your brand building needs. By not sticking out to key messages and having a lot of information placed in limited space, your brand loyalty value is sure to drop in the booth rental. When visitors come to your booth they need to see a unified and singular brand messaging. This should showcase the value proposition offered by the brand. With clutter, there is severe distortion and hence conveys absolutely nothing to the visitors at the trade show. Imagine two trade show booths – one with an un-cluttered and neatly organized space and another one that has stuff dispersed all over. It is clear which booth the participants would want to visit. With a lot of noise and clutter in your booth, it doesn’t take a lot of effort for the competition to poach the interested participants away from your booth and attract them to their well-organized stall. It is clear that not having things organized within the limited real estate of booth design is highly detrimental to the brand engagement objective at the trade show. By not giving the participant a clear reason to buy, the responsibility is on you for driving away sales that could’ve otherwise generated high volumes of business for your brand. Why is it Important to Have a Clean Booth Layout? Trade show exhibit rentals are crucial lead magnets for a brand. However, the success rate and noticeability depend on your representation. Every entrepreneur would like to harness his abilities, leverage the available resources, and make the most of booth rental. Carving a Niche: It takes time and efforts to stand out from the rest of the crowd. With stunning booth design, your task becomes easier. Customers will develop an acquaintance with your venture and get introduced to your brand as a reliable establishment. Visual Impact: How can you ignore the magic of remarkable, unique, and wondrous visuals? A trade show booth creates that magic and leaves an impact which is hard to ignore. Your targeted leads will have their eyes glued to your kiosk which will quickly channelize positive impulses to the brain. Quick purchase decisions will emerge as a natural effect. Most importantly, your target audience will keep your brand in mind even after leaving the trade show. High revenues: Revenue generation is an outcome of among other things, increased business visibility. If you are successful in attracting visitors to your booth at a trade show, you will surely witness a steady growth in enterprise revenues. Investing efforts in designing your trade show booth uniquely will be an effective move. Better ROIs: When it comes to making investments, you will surely like to achieve high returns and better ROIs. The exquisite and attractive designs of your booth rental will help you captivate the attention of innumerable clients simultaneously. If you can capture effective and potential leads at the right hour, earning huge ROIs won’t be that difficult. What factors Cut the Clutter and Improve the Booth Rental Layout? Your choice of booth design can reduce and cut down the clutter effect to a great extent. Astounding graphics, eye-catching designs, and vibrant hues can make the case for a smart and presentable trade show booth. You need to delve deep into the brand objectives and identify a central idea representing your brand. You will surely want your target visitors to remember your services through your booth design. But what is it that you want them to remember? There must be a central idea or crucial thoughts which will reflect your objectives. You have to be sure about this particular goal as that will help you translate design ideas into practice. While planning to design the trade show booth, relying on graphics will be a smart move. Attractive and eye-catching graphics will instill excitement in your customer’s mind. You can create a strong message and build the focus accordingly. On-screen actions and moving brand messages will impart a unique touch to the entire booth design. Across the brand accessories, business logo and digital signage, the text matter you have chosen to put up in the booth rental will always be crucial. Make sure it’s in line with your business objectives and reflects your brand accurately. Catchy yet meaningful copy has this quality of captivating consumers’ already short attention span. Don’t use numerous fonts together. Choose two or a maximum of three fonts and use them while creating the text. Legibility and comprehensibility are the other factors which are of huge importance. Too many text matters will affect the legibility thus failing to reduce the clutter effect. In simple words, keep it short, unique, and simple. Explore the world of digital creativity. Why not embrace the 3D space when you can do it perfectly. Choose 3D designs that emphasize your brand highlights. Moving visuals and three-dimensional booth design will successfully draw attention of several clients. Once you have drawn them to your booth, explaining your business plans would become quite easier. The 3D effects help you create virtual experiences that work for almost every brand. Integrating QR codes with booth designs is the new big thing. These resemble barcodes and can be scanned to track your web presence. Once they scan these QR codes, your booth visitors will be redirected to your webpage, interactive experience, YouTube channel, or online product descriptions. Keep in mind that you are creating experiences for visitors and that’s the reason to offer high-impact experiences. Static images will reflect your brand effectively but moving images always generate better responses on account of being more interactive and lively. Try to replicate the effects of graphic designs on a billboard. When it comes to designing the booth rental, moving images will be more effective compared to their static counterparts. Trade shows are effective means of getting leads for your business venture. If you wish to expand your client-base, participating in trade show exhibits will be a wise move to accelerate ROI via trade shows. The entire process should begin with smart designing of the booth rental. Other than design aesthetics, creativity, and color, you have to keep the brand objectives in mind. Unleash your creative side and choose a booth design that promotes an awe-inspiring and a strong brand presence. Investing in an attractive, captivating, and unique trade show booth can turn out to be the best decision.